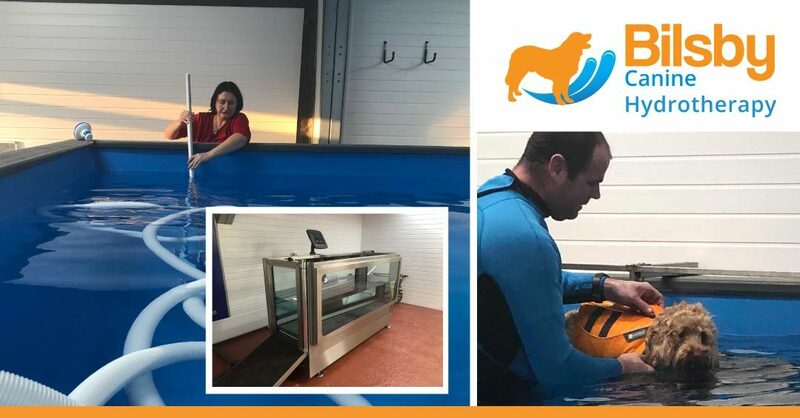 Looking for a new and rewarding career together, Lincolnshire dog lovers Paul Watts & Claire Elvin opened the doors to their dog hydrotherapy business, Bilsby Canine Hydrotherapy Ltd, in May 2018. Although Paul’s background was mostly in IT, his desire to change career paths led him to complete qualifications in “Level 3 Small Animal Hydrotherapy” and “Level 3 Treadmill Small Animal” which are industry standard qualifications for this line of business and a requirement for referrals by vets. Claire’s background is in accounts administration, which will no doubt be useful for a growing business, although she too will be taking the same qualifications as Paul at a future date. Paul and Claire tell us a bit more about their business and start-up journey. Can you tell us a bit more about Bilsby Canine Hydrotherapy? we provide a Canine Hydrotherapy pool & treadmill service. In conjunction with a vets’ referral, we also provide hydrotherapy & rehabilitation treadmill sessions for dogs. The kinds of dogs we treat range in size from toy dogs like Chihuahuas through to giants such as Leonbergers – which are a breed we are well familiar with, having had several! We also offer “Fun” sessions for dogs to enjoy exercise and gain fitness by swimming in our 7-meter long pool, which is deep enough for even giant breeds. Our business is unique in offering these services in the area. We have two co-owners /directors, Paul and Claire, who work in the business but we will employ more staff as the business grows to offer other services around the area of canine health and well-being. When we were looking to start up the business we searched online for “Business Support” and found the “Starting in Business” course by NBV delivered by their Beryl Pettitt – we attended in April 2018, and received help to get our business plan together. We had let the business aspiration drift somewhat before we were introduced to our NBV Business Adviser, John Owens.This refocused us on driving the business forward. With John’s help and encouragement, we applied for and were awarded two individual £25,000 loans from the Start-Up Loan Company, as well as a grant of £2,500 from NBV, which we used to help purchase our underwater treadmill. How has the business adviser/mentoring support helped you? The business advice and mentoring we have received has been really valuable to us – it has helped us to develop a business plan that has resulted in over £50,000 worth of funding. Without this, we would have found the process of developing our centre much more difficult. The mentoring support from NBV has also helped us keep focussed and we have felt very well supported and helped all the way along the process, from both Beryl and John and other NBV staff we have been in contact with. Our plans for the future are to ramp up the sessions of hydrotherapy and “fun swims” until Paul can be employed full-time in our centre. Claire will undertake her hydrotherapy certifications to allow both the pool and treadmill to be operated concurrently. We will also complete the internal layout plans for the centre, to allow the addition of other rooms whereby other therapists can be operating at the same time. The highs of the business were the opening of the unit itself to our first customer, knowing how much work we had put into it to achieve this. The lows were really around the difficulties (and additional expenses) of some of the groundwork restrictions that the local district council brought in at the last minute. We also narrowly managed to avoid the issue of our preferred pool supplier going bust just before we placed a firm order (with deposit) with them. This would have caused a severe delay and substantial financial challenges to us. 1: Get Advice – it’s much cheaper to learn from other people’s mistakes than your own, and a good business adviser has seen lots of challenges in other firms and can steer you away from similar mistakes. 2: Assemble a business plan, if you don’t you WILL miss things. 3: Have a contingency budget for those extras that spring up – e.g. our groundwork restrictions meant that we had to spend an additional £2,000 that we weren’t anticipating. Fortunately, we had a contingency reserve.